Your data analysts ought to focus on modeling the data, not wrangling it. 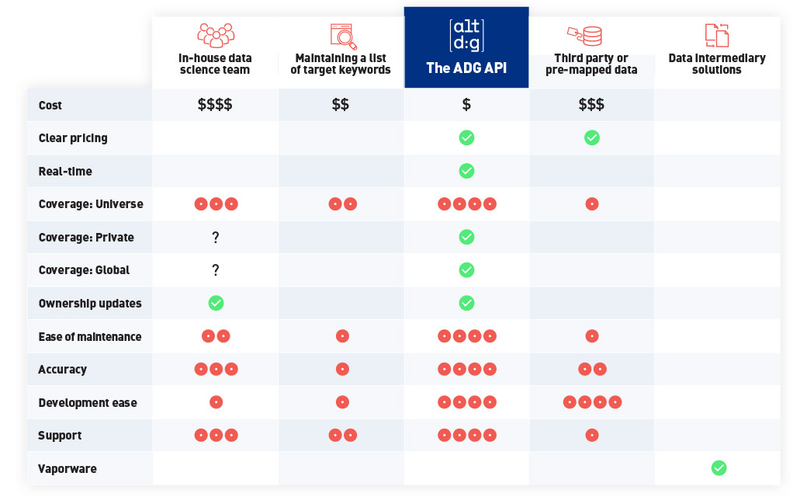 The Alternative Data Group API is a service that reliably provides structured company information from unstructured merchant transaction data or domain names. The API's accuracy of 99.2% and coverage of global public and private companies is unparalleled. Use the full API inside of Google Sheets without having to code. Just write or paste the data you want to process into the first column. Choose from simple to use and affordable pricing plans. Usage Limit: 100,000 Requests per Month. Contact support@altdg.com for enterprise plans. Map credit card strings, receipt text or other transaction DBs. ADG is the only option allowing analysts to map real-time company ownership structure to raw data. It's fast, affordable accurate and easy to use.